Surgical technologists are key members of surgery teams who provide pre- and post-operative services as well as assistance during actual surgery. The Midwest Institute Surgical Technology program teaches students the fundamentals of anatomy and physiology they need to know for their careers. They are introduced to operating room environments and receive hands-on training in sterilization techniques and instrumentation set-up, and learn about surgical instruments and supplies. Students are also trained in basic surgical skills and laboratory procedures that support O.R. functions. Our students learn first hand how technical skills, professionalism, attitude and confidence affect their growth potential. After successfully completing all required coursework, students are placed in unpaid Externships where they work under supervision with professional surgical teams. If you are looking for an exciting career this may be the choice for you! Classes forming now! Becoming a surgical tech might just be one of the smartest moves you’ll ever make. Not only is the job highly interesting and personally rewarding, but it can be a springboard to becoming a surgical assistant, nurse, or other medical professional. Surgical technologists are key members of surgery teams who provide pre- and post-operative services as well as assistance during actual surgery. Our Earth City Campus is located in the St. Louis, MO, metropolitan area. NOW ENROLLING: Surgical Tech Training – Right Here in St. Louis! The Midwest Institute Surgical Technology program teaches students the fundamentals of anatomy and physiology they need to know for their careers. 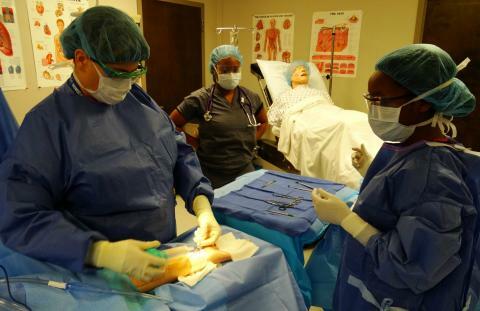 They are introduced to operating room environments, receive hands-on training in sterilization techniques and instrumentation set-up, and learn about surgical instruments and supplies. Students are also trained in basic surgical skills and laboratory procedures that support O.R. functions. After successfully completing all required coursework, students are placed in unpaid externships, where they work under supervision with professional surgical teams. Our students learn first hand how technical skills, professionalism, attitude, and confidence affect their growth potential. If you are looking for an exciting career, this may be the choice for you! Classes are forming now! Why Get Certified through Midwest Institute’s Surgical Technician Program? The demand for surgical techs is projected to grow by 30% from 2012 to 2022, which is much faster than the average for other occupations (source: Bureau of Labor Statistics). As Baby Boomers age and require more surgical procedures, and as operating technology continues to become more streamlined and efficient, resulting in more surgical procedures, your new skills and education will be in demand. Our surgical tech program thoroughly prepares you to certify following your completion of our CAAHEP or ABHES accredited programs. The training you receive from dedicated instructors will prepare you to pass the National Certified Surgical Technologist examination administered by the National Board of Surgical Technology and Surgical Assisting. Midwest Institute’s surgical tech program includes an unpaid externship, where you will begin real-life training in an O.R. with a professional surgical team. Midwest Institute’s surgical technician training is one of the best ways to get the education and experience you need to start a successful career in the field. We have been training medical students for over 53 years, and Midwest Institute is well-respected within the medical community as an institution that delivers highly trained graduates. Surgical Technologists prepare the operating room, including the sterile field, setting up surgical equipment, supplies and solutions. During surgery, surgical technologists pass instruments, fluids, and supplies to the surgeon and prepare and manage surgical equipment. They simultaneously manage the sterile field and specimens, as well as perform a count of sponges and supplies to prevent foreign retained objects. *Extern hours are DAY ONLY- No evening externship available. *All candidates must pass an entrance exam prior to enrollment. Surgical technologists are key members of surgery teams who provide pre- and post-operative services as well as assistance during actual surgery. Here you can see our students in action with Hands on Training!